Mainstream Fine Dining NYC: Vegan Options, Happily. In this segment of my Dining Out Vegan NYC Series, I'm tackling an issue that runs deep for gourmet vegan foodies everywhere: dining out at a mainstream fine dining, critic-approved, award-winning and raved-about restaurant. Adventurous Eaters. Some vegans and vegetarians choose to stick to dining options where veg-only-eaters are vocally welcomed with open arms via little asterisks inserted for the *v.=vegan options. And then other vegans, like me, want to remind the James Beard-awarded Chefs that special-diet-diners are paying customers too. And don't be confused - I'm not asking for miracles, just options. But yes, it is 100% possible to experience a fine dining vegan meal at some of New York's charmingly-snootiest, white-glove-polished restaurants. Veg Dining Part 1: Kitchen Errors, Waiters and You. Why I'm Not Nuts. Now don't think I'm nuts. I know that it's a tad pretentious of me to go requesting a vegan meal at say "Fine Dining Meats R Us" and don't get me wrong, I'm not asking for an exquisite vegan meal with tempeh, veggies, vegan cheese, grains ect at these mainstream restaurants. All I want are a few pleasurable options. I like to know that if someone invites me to a five star meal at say, Per Se, I can answer with "yes, I can go there!" Any invites out there?? Again, I'm not trying to ask for miracles, just options. Special diet folks are paying customers too. You may think that Eric Ripert's Michelin-starred restaurant is off-limits for veg-eaters. But not so! I went one evening with my husband and received an amazing vegan meal. Appetizer, vegan pasta marinara dish and dessert. It was pretty incredible, and I appreciated the professionalism of the staff - they assured me at every course that the dish I was presented with was indeed vegan - even the usually egg-containing pasta was subbed with a vegan version. Though I have never been to Per Se, here's what one Yelper said: "The folks at per se are incredibly accommodating to diners with dietary restrictions (making gluten free breads for one of my guests, catering menus for vegans, vegetarians, those who do not wish to have alcohol even in sauces, etc). Without fail, the folks here simply know how to make you feel welcome." I believe it. You usually get service that you pay for - vegan or not. A rare French restaurant I will rave about for vegans. They have a "vegetarian" tasting menu, which can be made vegan upon special request. Phone call approved fro vegans. Daniel is fine dining NYC at its best. Plus, Daniel is such a lovable Chef. Gordon Ramsey is pretty vocal about his hate of vegetarians. However, there is a vegetarian menu available. I am kinda scared to call this place, being that I keep envisioning Gordon himself answering the phone, laughing in my face and telling me to get out of town. Kinda kidding, but then again after two rings I hung up. :) I'm sure they would find something for a vegan, but I'm too scared to ask. Will you call for me? There is a vegetarian appetizer and entree offered each evening. And from my previous phone calls, I have been informed that vegan diners are pleasantly accommodated - although the options are extremely limited. But at a place like WD, that's OK by me. Yay for Wylie D, who is a really cool, fave Chef of mine. They do accommodate vegans upon special request. I have never dined here, but have heard good things. I was incredibly pleased when I called Little Owl and was informed that "the Chef is very good about accommodating vegan and vegetarian diners". I have not read online reviews from vegan diners, so perhaps I will have to be the first!! Definitely need to try this neighborhood foodie gem. Always gets rave reviews, even from folks like Martha Stewart. I am a tad confused by Blue Hill. They brand themselves as the pinnacle of farm-to-table fare. But in the end, if you peruse their menu - the vegans get left out in the cold, or so it appears. President Obama chose to eat here last year, and I'm sure he was impressed with his farm-to-table meal. 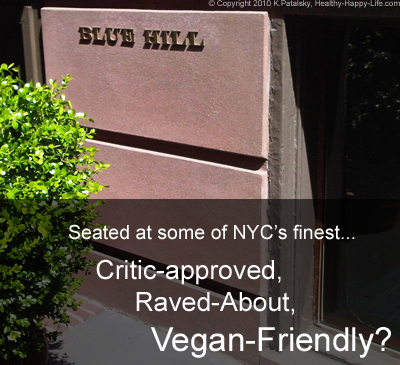 I have called Blue Hill in the past and they assured me that a vegan diner would be accommodated effortlessly. But I still wish that they displayed some vegan options on their menu - since the average vegan and I share with them a trustworthy affinity for fresh/local/organic ingredients. Vegetable tasting menu available, but from the menu and reviews of GT, I'd guess that it's not as vegan-friendly as you may like. I have avoided dining here because it seems like an obstacle course/land-mine dining spot for vegans. Have you been? Let me know..
Go on a Monday night for Dovetail's vegetarian Monday menu! The vegan items are easy to spot and the entire coursed meal sounds like a delight. Dovetail (on a Monday) is on my list of places to try. Dirt Candy Chef Amanda Cohen has a nice review of her Dovetail experience. Dined here for lunch one weekend afternoon. Brilliantly vegan-friendly. Veggies galore and amazing vegan pizza. Sorbet was fantastic too. Thumbs up for this Batali hotspot near Washington Square Park. 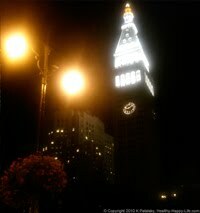 Another Batali hotspot on many top ten NYC dining-musts lists. A few Yelp reviewers went so far as to say that Babbo had "nothing" vegan. However, I called Babbo and asked about vegan options. The host answered with "yes" plain and simple, when I asked him about vegan options. So they could do it, how successfully, I can't confirm. Have not dined here - yet. But I've heard amazing things at this MOMA-central restaurant. I called The Modern and the hostess said "yes, absolutely" to my vegan-diner question. Bravo. Large, loud and fun. It's easy to order a vegan meal at an Asian restaurant, so go for it. However, a quiet, intimate night out is not this restaurants' style! I've lovingly dined at Dos Caminos more than a few times. Polished and proper fine dining, not really - but definitely a chic and trendy place for a festive night out. I adore the guacamole, salsa trio, vegetable tacos, plantains (no cheese) and side of rice. Oh and the sangria is yum too. I've had drinks and apps at Balthazaar, and while the line is always out the door, I've never stayed for a full fledged meal. It's French, so you know the options will be limited. Fun space with lots of loud energy. When I called, they assured me a vegan guest would be accommodated - so feel free to try it if you're in SoHo and in the mood. Can't confirm success though. Yes, vegan options are available - however the entree looks like it will be a combo of all the side dishes put together according to one yelper. But still, appears to be a nice option for adventurous vegan Bobby Flay fans. Called. The hostess said "Um, we have salads. We have a limited menu for vegan. You could talk to your server..." So, overall not terribly vegan-friendly I'm guessing. Darn! Because I do love Bobby Flay and the menu sounds fabulous in theory. Can't confirm a success story as of yet. Have one? Let me know! I've been to both BR sushi and BR restaurant. Both were very vegan friendly. And fabulous. Yes, yes, yes, Jean Georges loves to embrace vegans and I love that. Fine dining and vegan-friendly all the way. Just inform your server. Read: Jean Georges Likes Vegetarians, even Vegans! Called, was put on hold. After about a minute of on-hold promo music, the hostess came back with, "We have a few vegetarian options, but we don't really have anything for a vegan-diet. You can see our menus on our website." Yes, accommodates vegans according to phone call. I have dined at the Meatpacking-located Fig and Olive several times - always fabulously vegan-friendly. Tell your server. Dined here twice and vegan pasta was awesome. Yes the lack of cheese, with the same price tag is noticeable. But I really do love Felidia. Lovely for Italian-meal seekers. Great service. Cozy, intimate space. I love Public. They always have vegan options that are divine. Tofu, asparagus and mushrooms have been amazing in the past. Super cool place too. Nolita-chic. Energized bar scene. PS, same-company-lead Double Crown is vegan-friendly and awesome too, talk to your waiter though! Kinda had to sell my soul to get this reservation (not really) but I finally did it! Went here for my husband's bday a few years back. Had an amazing vegan meal in the company of lots of stars, celebs and other reservation-lucky foodies. Jared Leto was a table away from us, and the paparazzi outside all night were pretty entertaining. Fun spot if you can get an "in". I love Craft. Order all the veggie side dishes and have your own veg-tasting-menu. Just be sure to tell them to use EVOO instead of butter. Fiddleheads, peas and mushrooms oh my! Kinda love the fact that they serve seared tofu, whole wheat pasta and mushrooms galore. Need to try this seemingly vegan-friendly wine bar/restaurant. I love Mercer Kitchen. Can always find something on the menu. Cute spot in SoHo. Energized atmosphere. I love Morimoto. The table-made silken tofu dish is amazing! So many vegan options..
"q: are there menu items for vegetarians (or those with other special diets)? a: all vegetarian items are listed as such on the menu, however, we have few. please alert your server as to any allergies or special dietary needs you may have." Sadly, don't think they are too vegan-friendly. Hot spot for non-vegan foodies, but it looks like a 'salad' and shoestring french fry night for any vegans. You been?